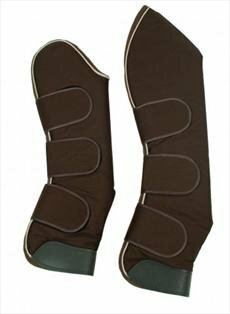 The Horseware Ireland Grand Prix Travel Boots are luxurious travelling boots for horses with a reinforced panel at the bottom of the boots for enhanced protection. The Horseware Ireland Grand Prix Travel Boots feature improved closures and decorative piping to match the rest of the Grand Prix Horseware range. If you have any questions about this product by Rambo, contact us by completing and submitting the form below. If you are looking for a specif part number, please include it with your message.